Hey Glee fans! 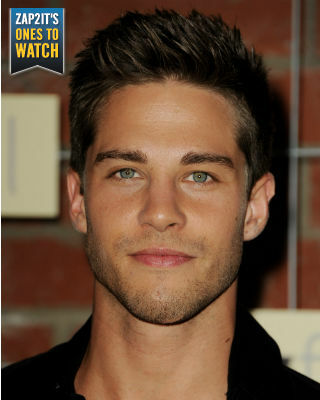 Tonight on the season premiere, you’re going to meet a lovely new face courtesy of Dean Geyer. We’ve posted about him before as we were huge fans of Terra Nova before it was canceled so we’re thrilled that he’ll be getting some recognition from the FOX hit. Back in Australia, he’s most known for being on Australian Idol, Neighbours, and over here in the states of course, Terra Nova. But now he’ll be showing up to make Finchel fans squirm. Check out this cute interview he gave to Zap2it about the 17 things you should know about him and get to know the Aussie actor! What’s the most embarrassing song is on your iPod? I’m not really embarrassed by the music I buy for my iPod, but i would have to say if my old rock band back home heard that I had a One Direction song and a Justin Bieber song on it, that would definitely get a few laughs. Zombie apocalypse! I’ve done martial arts my whole life and would love to round house kick a zombies a**! Do you have any current pop culture obsessions/addictions/guilty pleasures? I would say I’m the least obsessive person I know, but I was definitely very much into Facebook for a second there. But since I booked my role on “Glee,” Twitter has definitely become a priority for me to be able to keep in contact with my new fans. Wait! I lied. I just remembered that i am OBSESSED with YouTube! I can be on there for a whole day and not get bored. Anything to do with people feeling like they are gonna throw up makes me so anxious. I think anyone is grossed out by that. Who is your most recent text message from? At my friend’s lion park just outside of Johannesburg in South Africa or trolling for a big bluefin tuna just off the coast of Victoria in Australia. Tell us one thing that the general public doesn’t know about you. My secret passion is playing the drums. My first kiss was when I was about 13 at a primary school party at my best friend’s house, and we were forced into kissing each other. We were surrounded and bombarded with all the other kids shouting, “Kiss her, kiss her!,” so not the most romantic of moments. Is there a celebrity you’ve met who made you feel starstruck? I don’t think I have ever felt starstruck before. But I did meet Kate Hudson at the studio on my first day of filming “Glee” a couple of weeks ago, and it felt crazy and surreal to think that I was working on the same set as someone I’ve admired as an actor. I have always been a fan of her brilliant work. And plus she’s beautiful! I have to say though when I was working on set of “Terra Nova,” working with Steven Lang was an amazing experience for me. His menacing stare as my commander on the show made it hard to not be shaken, and there were a couple of takes where I was speechless because i was so intimidated by his presence! What do you have to have in your carry-on bag on the plane? Laptop, iPhone, water, wallet, chewing gum, sunglasses, couple of snacks, earphones, toothbrush and mouth wash in case it’s a long one, and some magazines. I’m pretty minimalistic. What celebrity would you “switch teams” for? I don’t think there is anyone that could make me want to switch teams. I am definitely a ladies kinda guy. My mom’s banana caramel pudding! If you could guest star on one other TV show, what would it be and why? I don’t know if this counts, but I would love to be on “Wipeout!” I’ve spent too many episodes laughing while watching that obstacle course eat people up, so now I think it’s my turn to supply some laughter. Which character from “The Breakfast Club” would you have hung out with in high school? I’m the biggest dork and believe that you gotta stay young for as long as possible, so people make fun of me on a daily basis just because I’m not afraid to act a little silly from time to time. What websites do you check most often? Pinterest is the first click as soon as I log onto the net, then Twitter, and then YouTube. What’s the most random thing in your wallet? I started using checks very late in life, so don’t laugh … but I have a check my girlfriend filled out about a year and a half ago when I ignorantly asked for instructions on how to fill it out. That stayed there in case i forgot one day how.